Students at Big Shanty Intermediate School in Kennesaw, Georgia, recently met Lizzie to learn some quick tips on how easy and tasty healthy snacks can be. 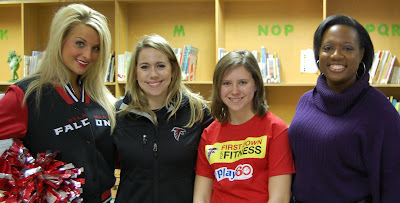 Lizzie teamed up with the Metro Atlanta American Heart Association and the Atlanta Falcons for the First Down for Fitness event which addresses childhood obesity through the NFL Play 60 Challenge. Students had an opportunity to learn the importance of keeping active and eating healthy on a daily basis. Assess and improve your entire family's heart healthy with the American Heart Association's My Life Check at www.mylifecheck.org.